Why my ad blocker is not working on YouTube? We watch more than 1 billion hours of YouTube videos every single day. That's more videos watched daily than on Facebook and Netflix combined. As of user number, YouTube has more than 1.9 billion logged-in monthly users, and that's second only to Facebook which has more than 2.2 billion. Well, given that you found this article, you are probably already aware of all that and spend some time in YouTube every day yourself. And, of course, it can be assumed that you are not happy that noticable portion of that time actually has to be spent on ads which you can't wait to skip. So let's have a glance at how to block ads on YouTube and reasons to why your adblock is not working on YouTube. To see what we can do about them, here are the types of ads one can encounter on YouTube. Overlay ads Appears across the bottom 20% of the video window (Desktop and laptop PCs only). Can be dismissed by pressing the "x" mark. Skippable video ads The most common ad format. Users can skip the ad after viewing it for 5 seconds. It can be inserted before, during, or after the video. Non-skippable video ads and long, non-skippable video ads Unskippable 15+ second ad. It can be inserted before, during, or after the video. Midroll ads Appear on videos over 10 minutes: ads are spaced within the video, like TV commercials. User must watch the ad before continuing through the video. Bumper ads A lightweight, non-skippable video ad up to 6 seconds long. User must watch the entire ad before the video can be viewed. Yes, if we're being honest about it, to get rid of all ads everywhere YouTube's very own YouTube Premium subscribtion is hands down the method with 100% effectiveness. But then again, it's paid and tied down to your YouTube account. The solution you need to block ads on YouTube depends heavily on the device and the OS you're using. Here's the flow chart which that is supposed to give you an idea, what suits your case and what is technologically possible and not regarding the Youtube ad blockers. 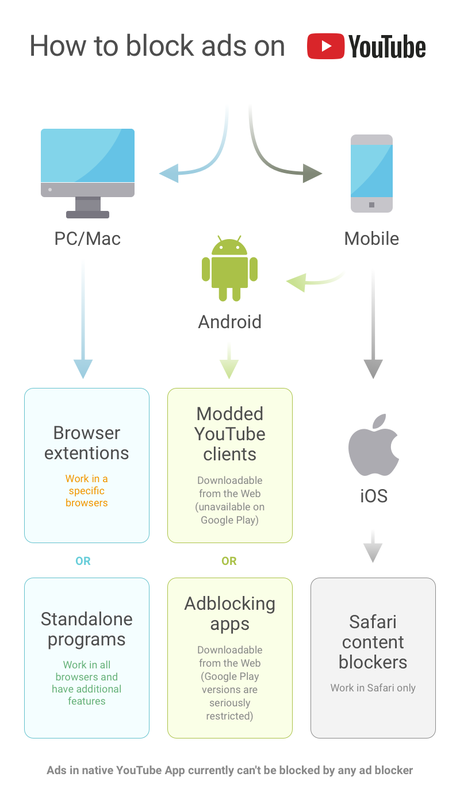 Below you can see the flow chart that shows how you can block YouTube ads with ad blockers, depending on your device's OS. For Mac PCs, options are basically the same, but we will put them here too, just for the record. Disclaimer: currently, no ad blocker is technologically capable of blocking ads in the native YouTube App on mobile devices. in the YouTube App and any browsers except Safari in case of iOS. With all said above, the method and adblockers you choose to remove YouTube advertisements is totally up to you. We’d be happy if the brief information above helps you find the best way. On our side, here’s a few solutions for annoying YouTube ads that we are proud to offer you, since we’ve been battling aggressive ads for a long time since 2011. Note that they they also include very effective arsenal for adblocking and privacy protection in general (not just YouTube). Watch YouTube videos without interruption in ANY browser — download AdGuard for Windows (FREE Trial) or AdGuard for macOS (FREE Trial). Watch ads-free videos in browsers with AdGuard for Android(FREE Trial). Enjoy your favorite YouTubers in Safari browser with AdGuard for iOS(AppStore FREE).